Seen a particular video you'd like to convert on Mac like a breeze? The free converter software will do the job. It's the era of digital video. From the first camcorders shown at the CES in 1981, to video cameras in the form of smartphone dated from 2000, to the YouTube empire begun in 2005, and the stunning 4K resolution in full swing, digital videos undergo a tremendous progress and are made ubiquitous nowadays. Accordingly, new trends emerge: 93% of younger Americans watch videos on their phone to prevent boredom; 42% of Americans aged 18-34 years had created and shared live streaming videos on social media. The video playback and creation prevalence gives birth to video-related software, such as video converter - I mean the Mac-specific video converting software, which I'd like to say a word or two in the post. MacX Video Converter is built in over 370 video/audio codecs that give you full control over whatever video decoding and encoding jobs. It is able to transcode 4K, MKV, MP4, MOV, HEVC, H.264 and more and make then playable on TVs, mobile phones, tablets, computers, and more without format issue. The reasons why you want a video transcoder for Mac vary greatly, and the demand on video file conversion increases especially when you reach out to other platforms or utilities, beyond the Apple's ecosystem. 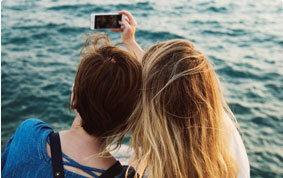 Here are some scenarios: You have some nice trip videos captured by your iPhone and want to make them fun to share on YouTube. But you are frustrated when importing them in a different editing package on Windows rather than iMovie. You have a substantial library of movies and TV shows that span years of downloads and copies, but only to find they are unwatchable on your Apple TV. What if you want to play 4K video on your old Mac that isn't 4K capable, if without a 4K monitor? Downloading a video converter for Mac to have these video files converted from one format to another seems like a good idea. Ready to watch videos, show off memorable moments, get media files well organized or create outstanding videos, whatever you want, the Mac video transcoding software covers almost all situations you find yourself in. 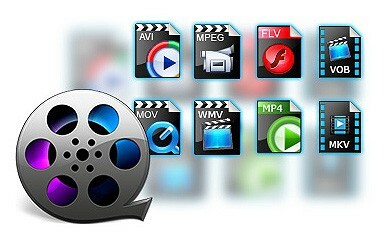 MP4, MOV, and M4V are pro-Apple ecosystem while WMV and AVI are frequently used in Windows platforms. Formats of high-definition videos shot by camcorders include DV, AVCHD, MPEG-2, H.264, MTS and others. Chances are you want to import a 1080p recording into your iPhone or put a media file from your Windows 10 to MacOS. This makes it sensible to download a video encoder and decoder on your Mac computer. HD and 4K videos are regarded as the biggest space hogs, Typically, uncompressed 4k video is approx. 350mb/min compared to 120mb/min in 1080p. Even though Apple employed HEVC codec in iOS 11, 4K videos still chew up iPhone storage space quickly, not to mention videos using H.264 codec. Compressing video to reduce the amount of data using HD/4K video procesing software will have your needs covered, whether you want to share over social networking sites, view over small iPhone iPad, or transfer through emails quickly. The process involves in changing to a format that takes up less space, lowering resolution, bitrate, frame rate, trimming the video file to shorten the length. Click here for a detailed tutorial to compress large videos >>. Videos can be uploaded within allowed length, formats, codecs, aspect ratio and more. Anything incorrect will destroy the upload process. For example, you cannot upload a 4k using HEVC codec to YouTube as it doesn't and hasn't made any plan to support HEVC. There will be black bars during playback when you upload a video at a non-16:9 to YouTube. A video converter will address the issues by processing videos like convert videos to FLV, WebM or MP4 that YouTube accepts, preferably MP4 H.264, cut unwanted parts and shorten the video within 15 minutes, downsize the video within 128GB, and change the aspect ratio to 16:9, if it isn't. 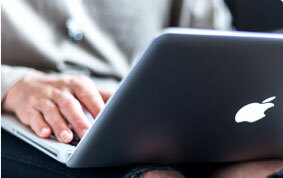 Learn more about how to upload videos to YouTube >>. Does QuickTime Meet Your Video Converting Needs? Users getting used to Mac platform may understand the QuickTime Player version 10 in OS X Mavericks and later allows to convert videos in older or third-party media formats by taking advantages of Apple ProRes. It can export video to the specific destination format supported by iTunes and iMovie, optimize the media file for the web, or set more general format by selecting "Export". But if you'd like to go further with video conversion, for your Android device, for example, QuickTime is still far from perfect due to the limited codec, Windows-repellent video format list, and the no batch processing option. 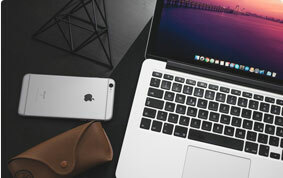 Without needing to go to Mac Apple Store for a reliable video transcoder from the vast selection of 3rd party apps, here we list 3 most welcomed free Mac video converter software that features speedy encoding and delivers good-looking image, if you are unwilling to get an expensive piece of software. 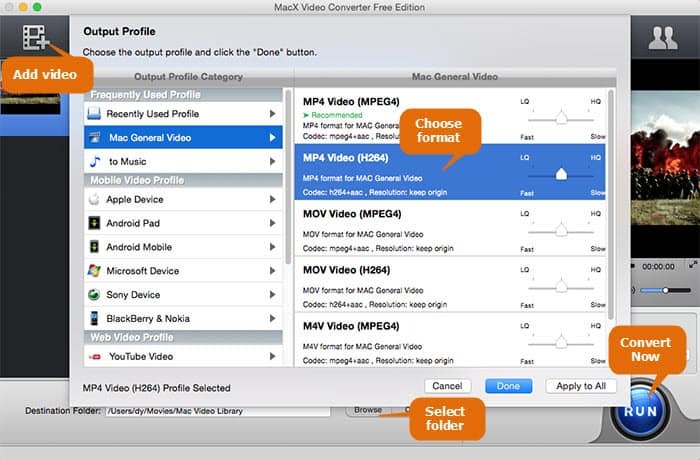 The 3 tools are MacX Video Converter Free Edition, HandBrake and Any Video Converter respectively. Below is an overview for each of them to help you better know the overall quality. MacX Video Converter Free Edition supports almost all the SD, HD, 4K UHD videos and has a mile-long list of input and output file formats, thanks to the built-in 370+ codecs and 350+ device profiles. You can feed MacX about any video formats, covering HEVC, H.254, MPEG4, MP4, AVI, MKV, MTS, M2TS, DivX, Xvid, FLV, VOB, and more. And the outputs are clearly classified by brand and property, from Mac specific video (MP4, MOV, M4V), web video profile, Apple device profile to DVD profile. That means it requires just a single tap to change the video format from one another and re-encode the video file tailored to fit your device, be it a smartphone, tablet, gaming system, or TV. A bonus point of MacX is its excellent video compressing feature. Besides encoding a video to a highly compressed format like FLV, WMV or MP4, you will be able to choose a video codec with good compression ratio such as HEVC for your iPhone iPad, change video resolution for normal screen, e.g. downscale 4k to 1080p, lower bitrate to reduce video file size, and tweak other parameter settings, e.g. frame rate, aspect ratio, and more, all housed within the Settings window. This is especially helpful to accommodate the HD, FHD and UHD video files in small phones without exhausting the storage space, or share them over internet or by email at fast speed. There is a friendly reminder: Make sure not to over-compress your video, or else, it is highly pixelated and becomes unwatchable as a result of losing too much amount of data. Another great feature found in this free video converter for Mac is the video editing knack, making it a truly useful and versatile freeware. 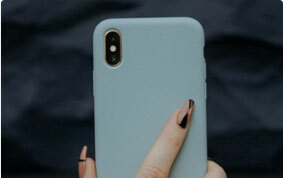 If you do need to further edit your videos, find the scissor-shaped icon aside the video and tap it to enter the editing zone, where you can cut off the commercial adds from video, crop the black borders from video with a flexible marquee, add subtitles/watermark to video and rotate video 90/180/270 degrees, etc. You may wonder why there is no merge feature. Calm down. It's located at the lower right corner of the main interface. Just toggle on "Merge All" and this feature is activated. When you first launch this program, you'll be very pleased with its clean and self-explanatory interface, where all users familiar with macOS will be hassle-free to complete the whole video conversion process, from drag and drop to load the source file, select the output to hit the RUN button. You can even set up many video encodes at once in MacX and even go for fast encoding or quality conversion according to your preference. But there is no 2D to 3D conversion feature. Any video converter worth its salt will be able to convert a wide selection of videos. Handbrake meets the basic requirement. It is a versatile, cross-platform and free transcoder for Mac, Windows and Linux, Windows for ripping and converting practically any type of video source for you to manage your video library. To freely convert video on Mac, load video via "Source" button. Then you can choose the output video format as MP4 or MKV. Although not as extensive as those offered in common freeware, the two formats supported by Handbrake cater to your needs by and large. There are readymade profiles including General, Web, Devices, Matroska and Legacy. Each offers detailed video resolution from 480p to 2160p and frame rate from 25fps to 30fps, meant to suit your device screen or web upload requirement. Actually, among various preset profiles, there is no large gap between Very Fast and Fast profile or HQ and Super HD in file size after the video conversion, but a big difference in conversion speed. 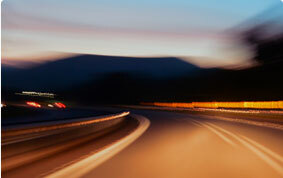 Generally, HQ gives you a much greater speed than Super HQ in video conversion. So if you have a bunch of videos to convert, you'd better choose HQ if speed comes first. For the layman, you're suggested to stick with the defaults and jump over the below confusing parameter settings. For advanced users, you can adjust those parameter settings if you're interested in, including video codec, frame rate, Bit rate, 2-pass encoding, audio sample rate, audio bit rate, video subtitles, etc. Providing you wanna remove unwanted parts from video image, you should go to "Picture Settings", where you are able to manually crop video image with specific numbers instead of the vivid marquee. Afterwards, just click "Start" button and this Mac video converter freeware's decoding & encoding engine will go into action. You are suggested to use two-pass video encoding if possible. This will make sure for better quality, though it takes longer than single encoding pass. One more thing, Handbrake successfully encodes videos in Hardware 1.0.0 or newer with Intel QSV. Graphic cards like Haswell or newer with HD Graphics on-board are enhanced to speed up the video processing tasks while unburden CPU for other jobs. But we are sorry to inform you that there is neither official E-mail nor the user manual/FAQs like MacX and AVC. You can visit its forum to communicate with other users if you have any problems like MKV converting error, video audio sync trouble, etc, or find answers from authoritative sites like Macworld, PCworld, which offer many Handbrake tutorials about video converting. Operating System: Mac OS X 10.7 or later | Mac 10.6, download Version 6.2.2. 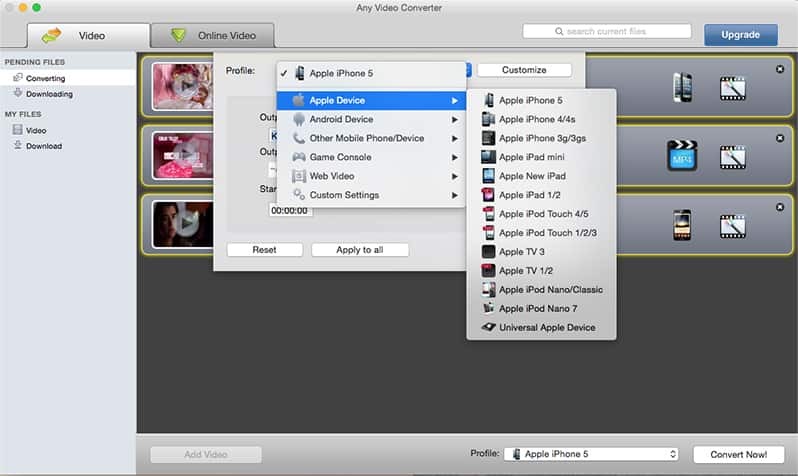 Any Video Converter, short for AVC, is one of the most useful and simple Mac video converter applications that are completely free. Similar to MacX, the supported video inputs is quite extensive, too. Whatever the standard video, high definition video or Ultra HD 4K video, it satisfies your needs. It's able to free convert video on Mac with more than 13 video and 15 audio formats supported, e.g. convert MKV to MP4, AVI to MOV, RM to FLV, AVI to WMV, MP4 to GIF, YouTube to MP3, etc. One downside: it doesn't offer you the power to upscale or upconvert video to HD/4K video format. Certainly, for those users who don't want any interaction in parameter settings, you can also click the device icon at the upper left corner to choose output profile, including Apple, Android, game console, etc. It is preconfigured with 70 profiles in total. The device profiles doesn't get constantly updated. For example, there is no latest iPhone X, iPhone 8/Plus or Galaxy S8/Note 8 profiles. And it quit now and then. But you can upgrade to Ultimate version to fulfill your need. And one unique feature the above two tools don't have is it can free download online video from websites including YouTube, Facebook, Vimeo, Dailymotion, etc. Then you can also customize your video before converting, click the "magic stick" icon to crop the black borders from video, adjust image size or add external subtitles to a video. The video merge, rotation and trim features are unavailable currently, nor can you adjust the aspect ratio. Thus, resort to the above Mac free video converters if needed. By the way, its company offers two ways to let you access to its technical support: FAQs and E-mail. Usually 1-2 workdays are required to give you feedbacks. Here we go hands-on to compare among 3 converters' performance so that you will have a direct-viewing impression on their video conversion speed, quality and compression ratio. All the datas in the whole test are real and exact. Note: The performance test is finished on a 27" iMac with 2.7 GHz Intel Core i5, 8GB1333 MHZDDR3 and AMD Radeon HD 6770M 512 MB, powered by Yosemite operating system. You shall also have to note that your computer configuration has a significant impact on the video converting speed. Higher config means faster speed. Please try to choose a comparatively powerful computer if you don't wanna spend too long on video conversion. Which One Convert Video Faster? The Golden Winner Handbrake is equipped with GPU-based DXVA hardware acceleration tech to quicken video conversion speed, finishing video transcoding in 54.91 seconds. The key thing to notice is, Handbrake performs HW accelerated video encoding on 64-bit Intel Mac (Intel Core 2 Duo "Merom" or later). The recent 64-bit Handbrake releases won't work with 32-bit Intel Macs 2007 or earlier. The Silver Winner MacX is well-crafted with hyper-threading tech and multi-core CPU (up to 8. e.g. a 8 core CPU is fourfold as fast as a 4 core equivalent). It takes 65 seconds to encode source MKV video into MP4, 10 seconds longer than Handbrake.There is a slider in MacX's device profile window, allowing you to choose whether to encode video faster or get video with higher quality. Once moving it to Fast, the converting time is twice as fast as the Slow. Though AVC hasn't any speed acceleration tech, its test performace is still worth a thumb up, just 1.5min lagging behind Handbrake. Which One Get Higher Output Quality? The video source is a high definition 1280x720 video in 2500 kbps. Well, AVC completely catches me off guard this time. It causes considerable losses on output video quality, with 1136x640 in resolution and 1000 kbps in bit rate. Pixelation results show when playing the output video. Can't bear the blur image from the output MP4 file. Both MacX and Handrbake do an excellent job of keeping high quality in output video. There is no grainy image showing in QuickTime at all. There is a subtle difference between the two in terms of the bit rate, the former getting 2901 kbps that is a little bit higher than the latter offering 2814 kbps. AVC stands head and shoulders above another two converters in video compression ability. Yet, it yields the output video file with much smaller file size (33.1MB) at the cost of quality. If you stress on file size, AVC is the winner. Comparatively speaking, MacX does even better. It makes a good balance between quality and video file size. It reduces 23.3 MB off the original video, up to 26% compression ratio, but the quality loss caused by compression is minimal, visually no difference from the original quality. As for Handbrake, it still has large room to get improved in video compression aspect, yeilding 78.7 MB file. At the end of the day, you might have your own answer about which one you favor. In short, the overall performance of MacX gets the highest mark in our top video conversion freeware for Mac review. The untouched video quality plus outstanding video compression ability earns it the first place here. Though its video conversion speed is not the fastest, it's still remarkable. Its flaws are small and its advantages are great. You won't have user's remorse with this program. Handbrake acquits itself quite well when it comes to free transcode video on Mac. Its video converting speed is amazing, beating the pants off another two free Mac video converters. 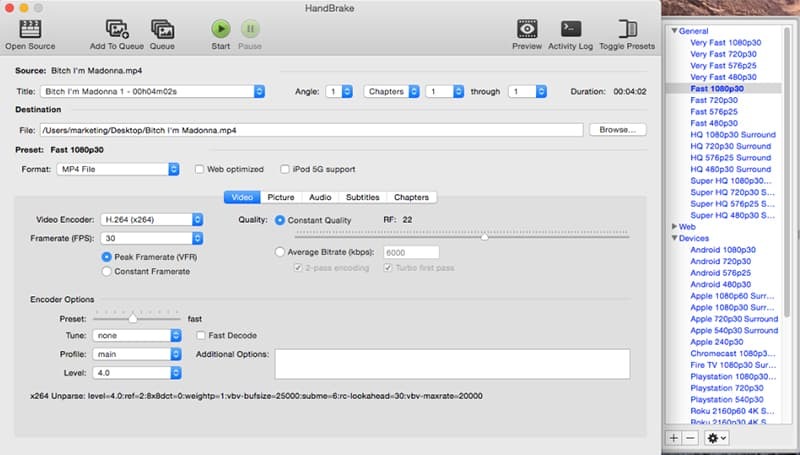 Though its limited output video formats and low-level video compression knack leave much to be desired, the latest version Handbrake 1.0.7 offers even more detailed profiles to let you convert video with preset parameter settings, no human interaction. That's quite thoughtful for users. AVC is a great choice to free convert video on Mac if you have no desire for HD/4K upscaling or profiles for latest device models. Besides, it gradually enhances its leading place in the Mac free video transcoder feild partly because of its powerful video downloading feature, furnishing you to free download video from 10+ online video sites other than 100+ sites exaggerated by its developer. At all event, the three Mac free video converters are worth a try. They will get your video files altered from even the most obscure format to the ones that you will have no problem to work with, no matter it is your computer, smartphone, game console, editing software or social media sites.